In 2016, the Implementation Working Group completed its second edition of “Development and Rational Use of Standardised MedDRA Queries (SMQs): Retrieving Adverse Drug Reactions with MedDRA”. The SMQ IWG held its 14th Meeting on 11-12 September 2018 in Geneva (agenda). Participants discussed the concept of MedDRA Labelling Groupings (MLGs) for use in reference safety information (minutes). A concept paper and a more concise one-pager have been submitted to the ICH MedDRA Management Committee for consideration. The MLG concept was also presented at the 18th Annual meeting of the International Society of Pharmacovigilance (ISoP), held in Geneva on 11-14 November 2018. Click here for details of the session and the presentations. Historically, the project began in 2002 as a CIOMS initiative, in response to concerns raised by some drug regulatory authorities and pharmaceutical companies regarding the parallel development of Special Search Categories based on the Medical Dictionary for Regulatory Activities (MedDRA®). This would result in a duplication of effort and uncertainty within pharmaceutical companies about the utility of these searches on the part of drug regulatory authorities. These drug regulatory authorities and pharmaceutical companies identified a need to harmonize and standardize their adverse drug reaction database search queries based on MedDRA to use the MedDRA terminology in a rational way and to allow comparisons of drug safety findings between different databases. However, at an early stage it became clear that such an activity would benefit from cooperation among stakeholders, i.e. the CIOMS Working Group, the MedDRA Maintenance and Support Services Organization (MSSO), the Japanese Maintenance Organization (JMO), the MedDRA Management Board (MMB) of the International Council for Harmonisation of Technical Requirements for Pharmaceuticals for Human Use (ICH) and the ICH Secretariat. In May 2003 the MSSO and the JMO joined the group, which was renamed the CIOMS Working Group on SMQs. Since 2002, the various CIOMS Groups responsible for SMQs have developed over 100 SMQs. In 2008 the Working Group downsized to a Core Group (CG), which has since met on a regular basis in order to maintain, review or develop new SMQs. CIOMS and ICH have a formal arrangement for collaboration on development and implementation of SMQs. An ICH advisory panel supported decisions on advancing new topics for development. In 2012, the SMQ IWG was formed to support the continued development and implementation of SMQs. This IWG includes representatives of regulatory and pharmaceutical organizations, as well as academia, the MSSO and the JMO, and meets twice per year. Its sub-teams develop specific candidate SMQs, e.g., SMQ for Dehydration and SMQ for Hypokalaemia, which are then taken forward in a well-established process toward production. The MMB (and later the MedDRA Management Committee) provide oversight. 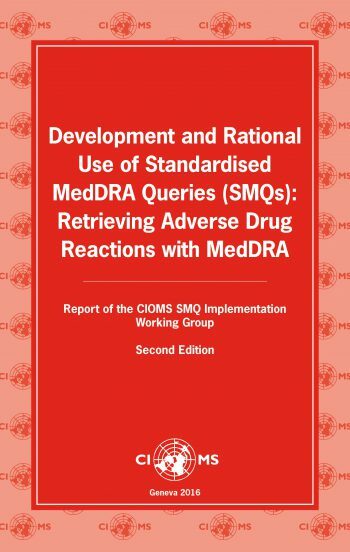 The IWG has also produced a second edition of “Development and Rational Use of Standardised MedDRA Queries (SMQs): Retrieving Adverse Drug Reactions with MedDRA” (known as the SMQ “Red Book”), which was published in August 2016. In parallel, the IWG continued to tackle challenging topics by further testing and refining candidate SMQs, including one for opportunistic infections. The current library of SMQs is extensive and the need for new SMQs has waned. The MSSO will continue to maintain SMQs in step with new production versions of MedDRA. Thus, the expertise of the SMQ IWG can be re-deployed to another, related project where there is an unmet need for harmonization. MedDRA includes more than 23,000 Preferred Terms (PTs) in its version 21.1. The MedDRA hierarchy provides groupings, but these are sometimes inadequate to clearly communicate a specific clinical concept that is meaningful for prescribers. The IWG is exploring the feasibility of developing principles for “MedDRA Labelling Groupings” (MLGs) for use in Reference Safety Information, such as medical product information/labelling, Investigator Brochures, or other aggregate safety data presentations (see box on the left for links to more detailed information).